Amazing mod, keep up man! Thanks Glad you enjoy it. It's getting near another release Just adding bits and bobs and trying to improve the finish at this point. probably the best mod in a long time, keep up the good work! Update: The rear axle is now back to how it was. with the addition of a swaybar and adjustable panhard bar. Sadly the car still doesn't like driving straight at very high speeds and starts fishtailing very easily. Normally you would fix this with some toe in in the rear, but since the car is a live axle rear it comes down to the roll-steer of the axle. The way the axle is setup now should in theory give an increased stability, just like toe in but for some reason its still quite unstable. any reason why theres a download link even though its not released and if so does it work? Haven't decided yet. I think its kinda boring getting it just ready to run though, more fun with the challenge of piecing it together yourself. But maybe i will. If you make the longitudinal engine for the pessima, I recommend you to make the separate jbeam engine code just like "pessima_engine_rwd" so it won't conflicted with the normal engine. it doesn't show up in game. why??? Yeah no worries. The mod will be completely independent. The F/R layout even has its own alternative unibody. 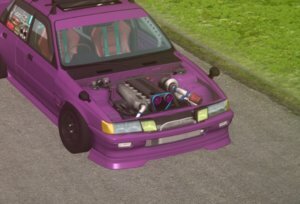 (with sunroof, right hand drive and live axle rear suspension as a bonus) The only reason i had the original pessima engine was because i did some stupid gearing time reduction thing that i forgot to remove from the mod before posting. could you make a config pls? Why would you think that the wheels turn automatically?